Herzform (gerade zulaufend zur Spitze hin oder geschwungene Form)? Herzgröße 6 oder 7 cm? Wunschfigur (falls Herzen mit Figuren!)? Übermittlung eines Fotos / Link zum Schild möglich? 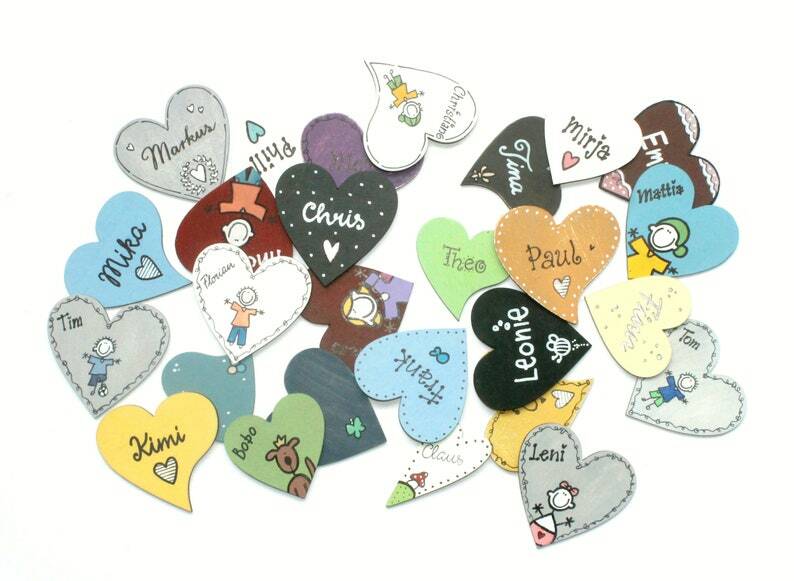 We have available for most of our door signs supplement hearts online. This offer because we can not cover every door sign. The hearts have a diameter of 6-7 cm (depending on need and desire) and are always designed to suit the respective shield. So you can finally add all the motifs that are presented without a trailer. Selection tables can be found in the product photos. The product is coated with clear lacquer. Hochzeitsgeschenk Türschild Schiefer Namensschild "Familientandem"
Supplemental Heart for Door sign "Carter"